There is something about the combination of rich, buttery dough with the warming flavors of cinnamon and nutmeg drizzled with heavenly glazed icing; its almost intensely euphoric. Do visions of cinnamon rolls dance through your head? Who needs buns of steel when you could have buns of cinnamon? 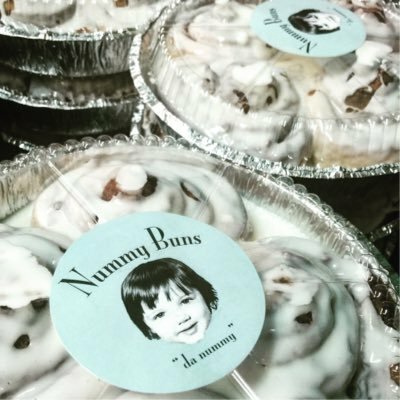 Middle Georgia heard the call and the votes have been tallied and here are the Top 5 businesses that bakes up the best, melt-in-your-mouth cinnamon buns! The number one spot goes to Nummy Buns. These flawless baked cinnamon rolls are airy and rich, with a menagerie of spices threaded through the roll in a dark mahogany ribbon of fragrant cinnamon that is made fresh locally with fresh local products; and that is something everyone can get behind! Just shy of two votes for first place, the Sweet Melissa cinnamon roll from Biscuits, Burgers & More is a giant, gooey cinnamon roll that is a go-to staple for breakfast or anytime of the day for that matter. The Sweet Melissa is a rich, buttery dough with the warming flavors of cinnamon and nutmeg that is loaded with cinnamon brown sugar and topped with Famous Mike's cinnamon roll glaze. Jennifer Walker, the baker behind Susie Mae Sweets and the granddaughter of Susie Mae has been baking up sweets for Middle Georgia for almost 10 years. While known for her beautiful cakes, Walker's old fashioned cinnamon rolls taste just like the ones your grandma used to make. They're soft, gooey and freeze really well, but should be served warm. Between Friends Coffeeshop & Cafe's cinnamon rolls are a guilty pleasure, especially fresh out of the oven and topped with their one of a kind frosting. Between Friends Coffeeshop keeps the very important frosting to dough ratio in check; not too much, never too little. Whether you like your cinnamon buns soaked, sprinkled or even "naked," there is a must-try cinnamon roll there for you! "The Bluetick" is known for its fresh produce and attracts visitors from across the country for its commitment to sourcing the finest ingredients in middle Georgia and beyond. But we're not talking about vegetables! We're talking buns, cinnamon buns! Bluetick's cinnamon buns are baked to give you the freshest, healthiest, organic cinnamon buns. Customers have fallen in love with Bluetick's buns and interest in their cinnamon buns continue to grow.